BEIJING — Zhang Yimou says the disappointing U.S. performance of the biggest budget China-U.S. co-production to date, "The Great Wall," may have been down to a weak story, but he hopes other filmmakers won't be put off from attempting such ambitious Hollywood-Chinese collaboration. "The actors are all very good; (star) Matt Damon and everyone was splendid," the acclaimed director told The Associated Press on Tuesday. "Probably the story is a bit weak, or the timing of it wasn't right, or we didn't do a very good job in making the film. There could be many reasons." Zhang spoke amid preparations for the Beijing opening of the stage play "2047 Apologue," which he described as a "conceptual performance" linking Chinese traditional culture with an imagined future of how humans will interact with technology. Producers of "The Great Wall" had hoped the movie with a $150 million production budget could buck the trend of China-U.S. co-productions failing to make a splash in both markets, at a time when movie makers wrestle with how to appeal to Chinese and Western audiences at the same time. The script for the 3-D adventure fantasy that has Damon and Chinese warriors fighting monsters with China's iconic Great Wall as protection took Hollywood seven years to develop. Zhang added elements of Chinese culture and his opulent visual style, seen in the romantic kung fu drama "House of Flying Daggers" and the 2008 Beijing Olympics ceremonies. "The Great Wall" has pulled in a disappointing $45 million in the U.S. since its February release, though it has earned $332 million globally. In China, where it was released in December, it made $171 million, making it the eighth-highest earner in the country last year. The movie was made by Legendary East, the Chinese arm of Legendary Entertainment, a Hollywood studio now owned by Chinese real estate and theater chain developer Wanda Group. Other companies behind the movie include the state-owned China Film Group Corp.; Le Vision Pictures, a private film company affiliated with Chinese tech firm LeEco; and Hollywood's Universal Pictures. 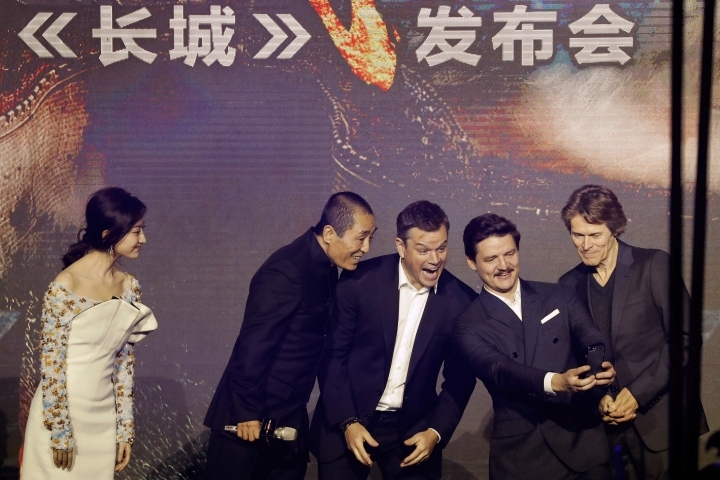 Zhang said "The Great Wall" marked a milestone in the collaboration of Chinese and Hollywood producers. "As the Chinese saying goes, 'all beginnings are hard.' I feel that this beginning is valuable. I hope that there will be more cooperation like this, that people won't stop just because the result wasn't so good," Zhang said. Pressed on whether he would attempt a Chinese-Hollywood co-production again, the director said: "It doesn't have to be me. I hope more people will collaborate like this." Zhang's new, much smaller-scale endeavor aims to start a conversation about the relationship between people and technology, and where this relationship is heading. He called "2047 Apologue" a "conceptual performance, because it's not a show or a story." Instead, he has hired Chinese folk art performers and companies from Europe and the U.S. to supply technology such as drones and robotic arms for the hourlong show that is broken into several "fragments." It will be performed at the National Center for Performing Arts in Beijing from June 16-18, and then tour several Chinese cities. It is slated to play in Edinburgh in August, as well as other countries that haven't been confirmed yet, the publicity team says. "Humankind has been so smart in developing technology that kills; the Americans are especially strong in that, right?" said Zhang. "When technology has become weapons that help us to kill, what is the relationship between it and us? Will it be used on you one day?" He said his inspiration for the theme could have come from wanting his children to spend less time on computers, something he never did as a child. 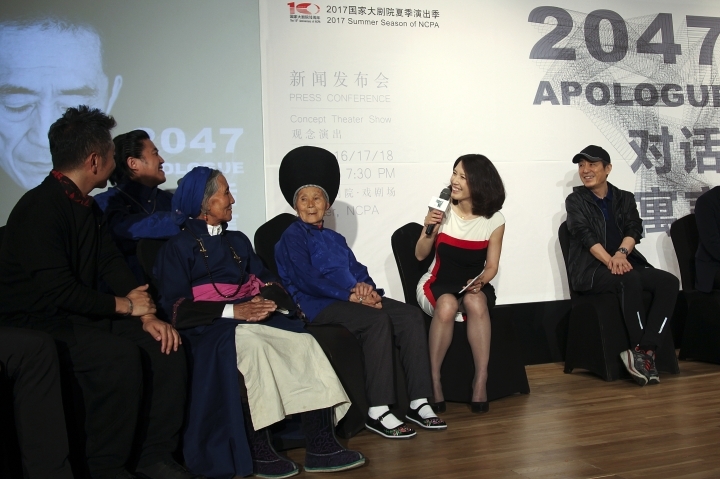 One of the performers, Peking Opera star Qiu Jirong, said that people were increasingly depending on technology, such as using their phones rather than a bank card to make payments, and "2047 Apologue" ''is telling you that this is a threat, too." He said his eight-minute dance performance involves a menacing laser that is out to kill him. "I want to escape, but can't," said Qiu. "When you think about it, humans made these things, and have released them. "I think these things are people's desires, and people are doomed in their desires."